Why the environment matters in the British EU Referendum debate | Environmental Europe? 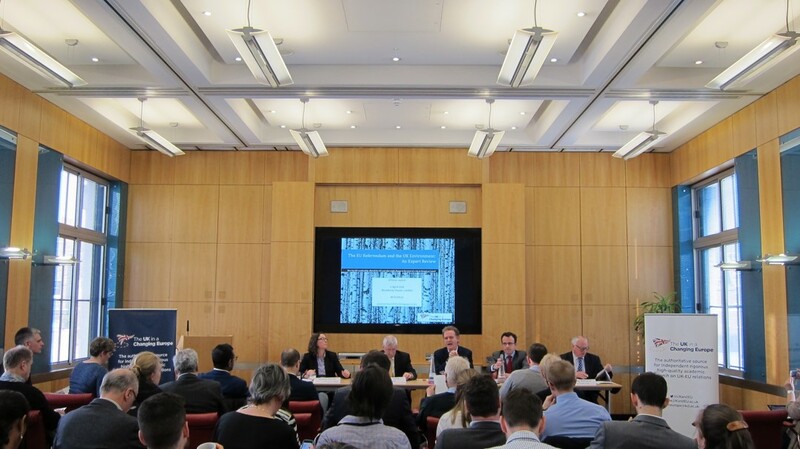 Monday 11 April saw the launch of an impartial and independent review: the EU referendum and the UK environment. Authored by 14 international experts – and led by the three of us – this review draws on the findings of over 700 publications to investigate how has EU membership affected the UK and what might change in the event of a vote to Remain or Leave in the forthcoming June 23rd referendum. The launch of the review was followed by a roundtable event in London which brought together senior representatives from the UK environmental sector to debate its findings. Monday’s event, organised together with the UK in a Changing Europe initiative, was the occasion to present our research findings to key actors in the environmental sector – NGOs, specialised journalists, think tanks – and debate with them about the future of the UK environment. Proceedings started with a presentation of the review’s main findings by Prof Andy Jordan (UEA) and Dr Charlotte Burns (University of York). Andy Jordan stressed the two-way nature of EU-UK environmental relations. The EU has helped to modernize the UK’s environmental policies since 1973, with a policy style which is more preventative, underpinned by fixed standards, clear deadlines and explicit principles such as precaution and sustainability. The EU’s impact has also been felt on related sectors such as agriculture, fisheries, energy, and to a much lesser extent, land use planning. But Europeanisation of UK environmental rules has been uneven: the EU’s impact on UK policy structures (e.g. whether environmental policy is centralised in London or devolved to Scotland, Wales and Northern Ireland) remains very limited; there is certainly no green ‘super-state’ in Brussels. Indeed, influences have gone both ways, with the UK also influencing EU environmental policy. For example, the UK has been leading the EU on the fight against climate change. But it has also been one of the strongest voices in Brussels calling for ‘better regulation’ narrowly understood as cutting ‘regulatory burdens’ in general and environmental ‘red tape’ in particular. Charlotte Burns outlined the three scenarios in the review. 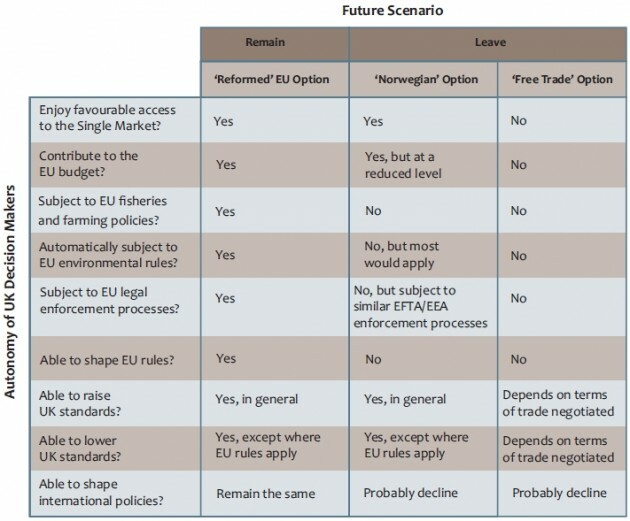 The review highlights that there are some risks associated with a vote to ‘Remain’, something which this blog previously discussed: the continued presence of the UK, the greatest cheerleader for reducing ‘regulatory burdens’ at EU level, may put parts of the EU environmental acquis at risk. 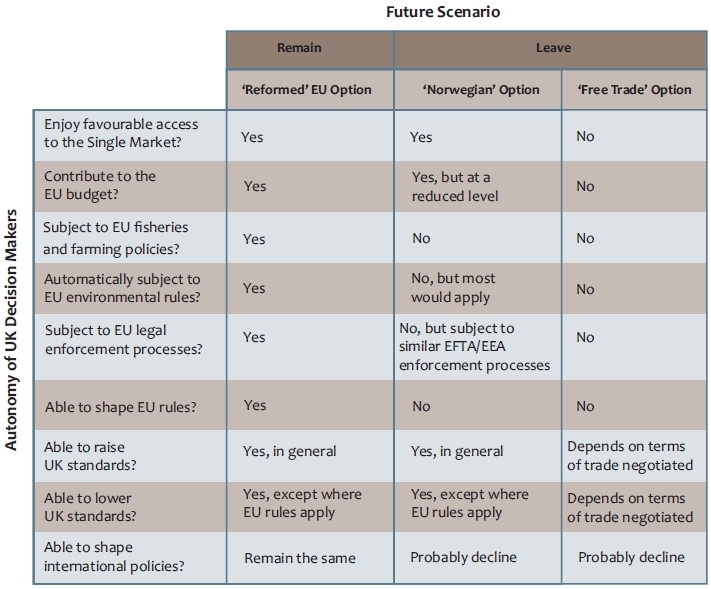 But there are greater risks under the two Leave scenarios. In both cases the EU bathing water, birds and habitats rules would cease to apply in the UK, as would the CAP and CFP. In the ‘Free-Trade’ option, a larger swathe of policy could be at risk, although product standards – required to trade with the Single Market – are likely to be protected. The review stresses that while UK politicians could use a Brexit to increase environmental standards beyond the EU baseline, they already have this right under the EU Treaties and rarely choose to do so. David Baldock (IEEP) further stressed that as the current government was contesting the stringency of EU air pollution standards in the Courts, it was very unlikely to increase them in the case of a vote Leave. The roundtable, chaired by Matthew Spencer (Green Alliance) discussed how EU membership had affected different environmental sectors. Philip Rothwell (The Wildlife Trusts) argued that the EU habitats and birds directives underpinned UK domestic wildlife rules, and that important funding for wildlife came from the Common Agricultural Policy. He expressed concerns that both would cease to apply, even under the ‘Norwegian’ option for Leave. Mike Clarke (Royal Society for the Protection of Birds) stressed that while the CAP had improved, it needed further reform by 2020 to reverse biodiversity loss, following a public money for public goods approach – as would an alternative UK agricultural policy. He argued neither Remain nor Leave (to a greater extent) campaigns had fully engaged with the environmental dimension of the EU referendum debate. Melissa Moore (Marine Conservation Society) told the audience that the Common Fisheries Policy had been profoundly reformed, and that it now needed to be fully implemented. She explained that under the current quota allocation system the UK has the 2nd largest quota (behind Spain), which is unlikely to remain the case under a Brexit. Finally, Nick Molho (Aldersgate Group of green businesses) argued that common EU product standards boosted consumers’ confidence in innovative products – and that a vote to Leave under the ‘Norwegian’ option would mean cutting-edge UK companies would need to keep complying with EU rules while having lost influence over them. The ensuing discussion with the audience highlighted how this review differs from previous publications on EU-UK relations: notably, by considering international policy, national policy processes and environmental groups. It also brought to light further questions and uncertainties: first, the costs associated with the different scenarios (which are hotly debated). R. Andreas Krämer (Ecologic) suggested that EEA membership (the ‘Norwegian’ option) is unlikely to save the UK any money as while the UK would no longer have to pay in to the CAP budget it would also lose its agricultural rebate, cancelling out the benefit of reduced payments. Second, the unpredictability of British politics after the referendum: while the review suggested that an Act of Parliament should be adopted to maintain the effects of directly applicable EU law (e.g. EU regulations) after a ‘Brexit’, Baroness Young (one of the co-founder of the Environmentalists for Europe group) argued that Parliament might be too divided after the referendum to pass such a bill. Discussions at the launch highlighted once again that there is a strong desire to consider the environmental dimension of the referendum – something which the UK government in its recent leaflet failed to do, and which neither the main Leave or Remain campaigns appear keen to do. It thus falls to many others, including Environmental NGOs, think tanks and researchers to raise the profile of environmental matters. Andy Jordan is a Professor at the Tyndall Centre for Climate Change Research and author of Environmental Policy in the EU (3ed). This entry was posted in Current Affairs, Democracy & Citizenship, Energy & Climate Change, Environment, Politics & Public Policy, Publications & Events, The EU and tagged Brexit, climate change, Environment, EU referendum. Bookmark the permalink. Next: Was hat der Klimawandel mit Flüchtlingen zu tun?